Desert AIDS Project (D.A.P.) announced an alliance with Sanctuary Palm Springs (SPS), a transitional residential program providing housing and independent life skills for foster youth who are 18-to-21 years old. Residents will be able to turn to D.A.P. for their medical, dental, mental health, transgender care (both medical and psychological), HIV education, drug and alcohol counseling, employment counseling and pharmacy needs. The alliance was showcased today at a ribbon cutting at the newly remodeled SPS residence in Palm Springs, with a keynote from Mayor Robert Moon, and congratulatory addresses by city councilmember Lisa Middleton, and D.A.P. chief executive officer David Brinkman. 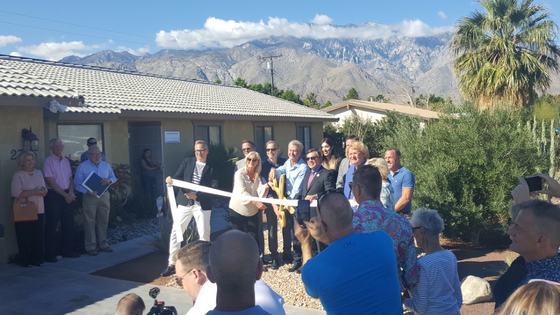 Several community members and supporters, including the Palm Springs Chamber of Commerce, local media, and volunteers stood in the front yard of the home for the ribbon cutting. Embracing the humanitarian dedication of Sanctuary SPS founders LD Thompson and David Rothmiller, D.A.P.’s David Brinkman said the two organizations were perfect to unify for this endeavor. Sanctuary Palm Springs is the creation of filmmakers and authors David Rothmiller and LD Thompson. Their goal is to provide LGBT teens in foster care a family home environment, a place of safety and stability. A caring and professional staff provide emotional support, in addition to an emphasis on education and the arts. Palm Springs interior designer Christopher Kennedy chose many of the fixtures, lighting and accessories for Sanctuary Palm Springs. All six bedrooms also are adorned with brand new MODE furniture, provided by Revivals Stores. Desert AIDS Project (D.A.P.) is a Federally Qualified Health Center in Palm Springs, CA offering D.A.P. Total Care – a combination of medical, dental, counseling, social services, support groups, alternative therapies, in-house pharmacy and lab, and other health and wellness services. D.A.P.’s sexual health clinic, The DOCK, offers STD testing and treatment, Pre-Exposure Prophylaxis (PrEP), Post-Exposure Prophylaxis (PEP), and free HIV and HCV testing. D.A.P.’s Get Tested Coachella Valley campaign, the nation’s first region-wide HIV testing and access to care initiative, was recognized by the White House for helping to bring about an AIDS-free future. D.A.P. is rated a “Top 20 HIV Charity” by About.com. Visit www.desertaidsproject.org, www.thedockclinic.org, and www.gettestedcoachellavalley.org to learn more. Sanctuary Palm Springs (SPS) is a Transitional Housing Program specifically designed to meet the needs of the LGBTQ community of foster youth transitioning to adulthood. If you are 18 – 21 and are – or have been in – foster care and you would like to have a safe, welcoming home in which to successfully transition to adulthood, Sanctuary Palm Springs is the place for you. Call us today to begin the application process. (760)766-3500. If you know someone who needs the additional support available through the THP+FC program, please share this site with them. To find out more about Sanctuary Palm Springs, visit www.facebook.com/LGBTSanctuaryPalmSprings, www.twitter.com/sanctuaryps, and www.sanctuarypalmsprings.org to learn more.